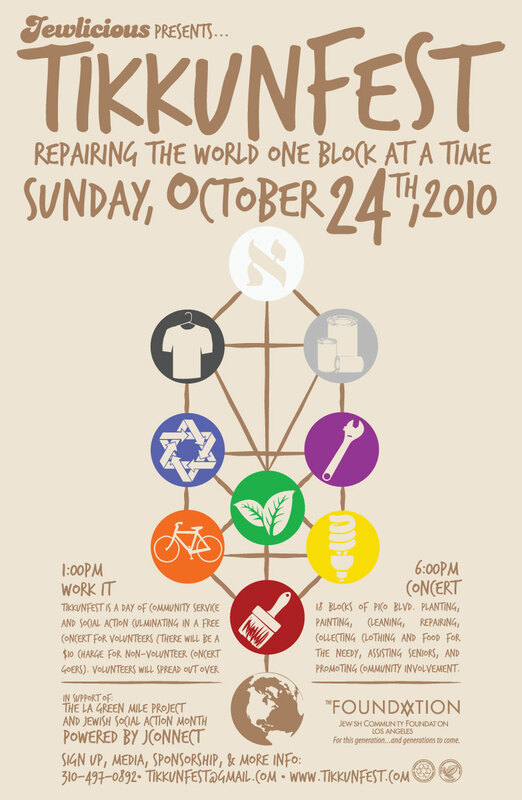 There are lots of things you can do this Sunday (sleep in, go to Ikea, ponder the irony of saying “l’chaim” to life before we drink if drinking kills brain cells), but there is one thing you can do TO MAKE A DIFFERENCE THIS SUNDAY, OCTOBER 24th: TIKKUNFEST. Your contribution will change the way Angelenos see the Chood (Pico Robertson) and revive our beautiful neighborhood- all with just a shovel and a microphone. And, if you volunteer for at least 3 hours, you will get FREE admission to the after party with hundreds of other volunteers! 1. Click “YES” on Facebook! 5. Email or pass out Tikkunfest flyers to your friends, family and enemies (mostly because it annoys them). Let them know they can bring their unwanted electronics, old clothes, and extra food to Tikkunfest even if they can’t stay the whole day. (We have them in PicoRobertson or Century City.